Play Dates Monday 10th to Saturday 15th October 2016 with a matinee on the Saturday. First rehearsal is expected to be Sunday 28th August but this will be confirmed following the auditions. 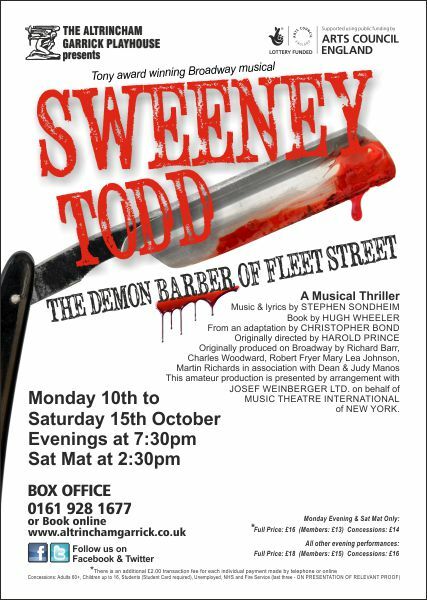 One of the darkest musicals ever written, Sweeney Todd: A Musical Thriller is the unsettling tale of a Victorian-era barber who returns home to London after fifteen years of exile to take revenge on the corrupt judge who ruined his life. When revenge eludes him, Sweeney swears vengeance on the entire human race, murdering as many people as he can, while his business associate Mrs. Lovett bakes the bodies into meat pies and sells them to the unsuspecting public. Perhaps composer/lyricist Stephen Sondheim?s most perfect score, Sweeney Todd is lush, operatic, and full of soaring beauty, pitch-black comedy and stunning terror. It?s one of the signal achievements of the American musical theatre of the last fifty years, and it?s the high water mark of Sondheim?s six remarkable collaborations with director Harold Prince. Following the huge response for our auditions for the musical Sweeney Todd last Wednesday evening we are very pleased to announce we are extending this process by doing recalls next Thursday 4th August from 5.30pm, all candidates will be notified of this direct. Recalls on this evening will also be taking place from 8.00pm for small roles/ensemble and again all candidates will be notified direct. with ‘SWEENEY TODD’ in the subject of your e-mail,?thank you.